The first of the flying scourges (as some would see them) darkened Austin’s skies in the late 19th century. Back then, locals considered the birds beneficial, as the predators forestalled the city’s cricket infestation. Others outside the city limits decried the grackle because of the birds' indiscriminate diets – they would eat not only the pesky crickets and cotton bollworms, but also the crops themselves. This led to the wholesale slaughter of the grackle at the hands of children, who were encouraged to use the iridescent-feathered creatures to further their marksmanship skills. Dear ladies of the Mothers’ clubs, when you see your son with a gun in his hand and a belt of shells around his waist, disarm that boy and teach him that he can find diversion without contributing toward the total annihilation of his own race. 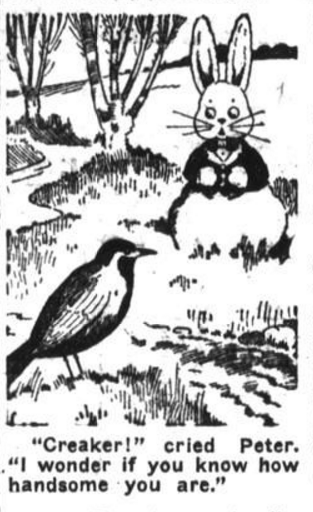 A 1919 cartoon that appeared in the Houston Post featured "Peter the Rabbit" meeting "Creaker the Grackle" in a story praising the birds' usefulness. Credit Portal to Texas History. Still, other Austinites abhorred the grackle from its early days of flight. Not only that, Bedichek maligned the grackle’s parenting ability. To be fair, grackles are known for their promiscuity, but Bedichek seemed to take it personally. Bedichek’s disdain was echoed years later in a 1962 Statesman letter to the editor written by Mae Sockburger, who lamented the loss of Austin’s mockingbirds at the hand of the “filthy and noisy” grackle. While Sockburger called for a repeal of the Migratory Bird Act and an extermination of the birds, the Statesman qualified the birds’ presence, offering both a welcoming of the grackles’ “mischief” and an explanation as to why the birds were here to stay: Austin’s growth. Want more on the pre-Columbian history of grackles? Curious about why they always seem to congregate in grocery store parking lots? Check back tomorrow for the next story in our ATXplained series. On Thursday, the next Batman movie will hit screens in Austin. While it’s technically a Superman movie, the Dark Knight’s top billing in “Batman v. Superman” and some of the early reviews intimate otherwise. But, nearly 50 years ago, the Caped Crusader’s first film outing flew into Austin for its premiere. Austin, it seems, is locked in an eternal personality crisis. To some, it’s the greatest city in the world – a wellspring of natural beauty, good food and plenty of live music. To others, it’s an ever-expanding, traffic-plagued, corporate-sponsored city that’s not as good as it used to be. In honor of Texas Independence Day, this week we’re looking back at the mystery of the Texas Constitution. The mystery being that, after 180 years, it doesn't technically have one in effect, because the State of Texas has never formally recognized one of the many versions of its constitution. There’s a war going on. And, like most unnecessarily irksome dustups involving Austin, it centers around tacos – specifically, breakfast tacos. If you’ve ever lived – or even spent a weekend – in Austin, you know we’ve got a thing about street names – namely, mispronouncing them. There’s GWAD-a-loop. BURN-it, MAY-ner and MAN-chack, or Manchaca. Our next ATXplained voting round is here. This time, it's all about birds. So far, we've collected nearly 150 questions about everything from Austin's allergens, its streets and highways, its iconic places and events, and even some simply answered questions, like what exactly our programming schedule is — for future reference, you can find it right here.